FEINE SAHNE FISCHFILET from Mecklenburg-West Pomerania have done everything right so far. With the unforgettable daft-genius band name and their strictly antifascist attitude, not only in their lyrics but in general - they became more and more famous in their area, and since their first releases their popularity became nationwide. 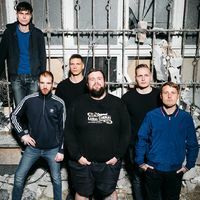 In an area where antifascist engagement is a matter of personal security, the band stands for an hard-line, cheerful alternative - with a weakness for an excessive lifestyle. After the first two albums „Backstage Mit Freunden“ (2009) and „Wut Im Bauch Und Trauer Im Herzen“ (2010) were sold very good by their underground-label, the band started to expand their touring-radius. The happy-go-lucky sextet around vocal monument MONCHI even toured Eastern europe and became highly acclaimed in the punk-media. Punkrock with wind instruments (no, not ska) and unmistakeble statements are still the device. AUDIOLITH, punks in attitude and origin since always, feature the first real punkrock-band on the label - FEINE SAHNE FISCHFILET.